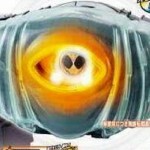 With the premiere of Kamen Rider Ghost only a week or so away, it’s time for the merchandise to begin hitting in full swing. 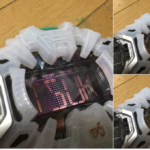 With that, here’s a quick demonstration video of the upcoming DX Ghost Driver toy. It looks … pretty awesome, to say the least. Check it! Thanks to our pal @SSJ3__Goku on Twitter for the find! What do you think? Plan to pick one up? Sound off in the discussion thread! Amongst the blitzkrieg of Figuroh Magazine tonight, we have new information regarding the upcoming Complete Selection Modification DecaDriver with a few of the cards having been revealed. 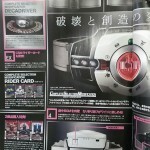 In the last update, it was revealed that a selection of Rider Cards will be sold seperately from the belt itself. This archive will contain every card used by Decade spanning his TV and film appearances, and a few of those cards have been revealed in these scans. Of course, we have the card for Decade Violent Emotion, in addition to Attack Ride: Side Basher, Ongekibo Rekka, and every blank Rider cards seen earlier in the show’s run just to name a few. Not only that, but pressing a button located on the bottom of the belt plays the show’s BGMs Parallel World and Decade. Both the belt and Rider cards will be releasing via Premium Bandai in February 2015 for 12,960 yen and 7,560 yen respectively. Buying them both and you’ll get the Final Attack Ride Diend, Kaijin Ride Eagle and Moose Undead cards.